Neither of these cards probably do Dixon Edwards enough justice. The ProSet pose feels obviously staged and faked, while the Classic 1991 is just one of the ugliest cards I’ve ever seen. Whoever convinced the Classic card corporation that grey on grey leopard print on a football card would be good looking should be thrown down a hole. 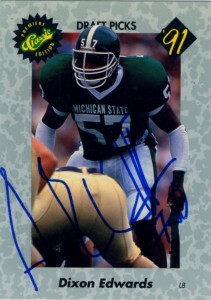 Dixon Edwards was drafted in the 2nd round of the 1991 draft with a pick that was directly related to the Herschel Walker trade. When we got his autograph at training camp he had this very odd hair style and pencil thin mustache. A rangy linebacker with good speed and coverage ability, Edward’s strength was playing weakside lienbacker, but he had the ability to play inside, outside, or the middle linebacker position. He’d contribute at left linebacker and special teams for the Dallas Cowboys organization through their SuperBowl years starting for the team from 1993-1995 after two years as a backup. 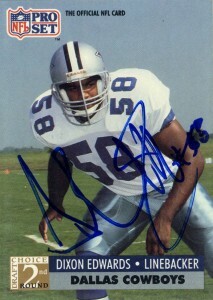 After his stint in Dallas, Edwards would play for the Viking organization from 1996-1998 where he would excel. In 1999 Dixon would then sign with the Dolphins where Jimmy Johnson was building ‘Dallas South’. Edwards would be diagnosed with an irregular heartbeat in training camp and would retire soon thereafter.